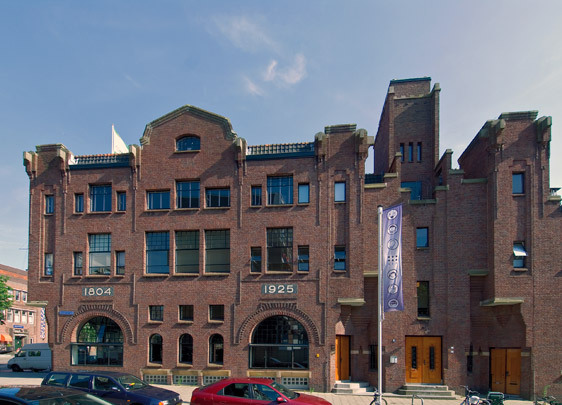 This printworks has its main facade on Pieter de Hoochweg, though the longest facade is in Dunantstraat. Here too is the main entrance, marked by a tower-like feature. This makes the transition to the less-tall, less exuberantly designed printing shop. The facades of the office portion have arched windows, mansard-like roof elements and ornaments in brick and stone. The indenting in the brickwork may refer to matrices from the printing shop. Wyt was taken over in 2001 and has moved out; several architecture firms are now domiciled in the recently restored building. Kromhout also designed the Port Employers' Assocation Building across the street.